Last night I got home at 3:00 from the first ever multi-nation WordCamp, WordCamp Europe 2013 in Leiden, The Netherlands. The weekend was packed with many inspiring talks, but above all it was a unique chance to meet other developers and designers from around Europe and the world. Based on discussions I had during the past two days, advanced use cases of WordPress as an app platform are becoming more and more common. I also had the opportunity to talk to many WordPress “superstars” like Andrew Nacin, Nikolay Bachyisky and The Matt. Putting together a conference of over 700 people can not be an easy task, but everything went pretty much without a hiccup (there were occasional wifi problems but that’s almost to be expected). A big thanks to the international team of organisers! In an earlier post, I promised to shed some light on our git workflow for WordPress projects. The above image sums it up pretty nicely, but read on for the details. Most of the development we do happens in a local Apache + PHP + MySQL environment, using MAMP Pro. That means I have a local copy of each site I’m developing, which creates some overhead compared to everyone just working on a central dev server. It’s worth it though because it makes working on different features and code branches easy. When I want to share code with my colleagues or am ready to something to a client, I do a git push to a central repository hosted on Beanstalk. Beanstalk has loads of useful features, but the best thing about it has to be the simple deployments it offers. For all projects, we set up automated deployments to a staging server, where we have copies of each site. Deployments to production are also set up in Beanstalk, but (intentionally) require a manual click in the web app. Finally, moving from staging to production can require some tricky search-and-replacing domains and absolute paths in the database. WordPress in Network mode tends to be particularly keen on saving the site URL in way too many places. One way to do this is to perform a search and replace on a SQL dump, but we use this nifty tool by Interconnect/IT, because it correctly handles serialised strings, which are often used in WordPress for things like widget options etc. The same tool is useful when doing the reverse, ie. creating a local copy of an existing site. Over a year ago, Jeremy Keith wrote an excellent post on enhancing the performance of responsive sites by checking for a minimum screen width before loading secondary content such as related news and latest tweets. Mobile devices would just show a link to the content, thus keeping it accessible. In this post I’ll show how to do a similar thing in WordPress. I thought there should be an easy way to delay the loading of any secondary content, and my first thought was to use the very simple .load() method in jQuery along with a custom page. For instance you could create a special template to show related blog posts, and display a link to that page. On wide screens this link can be replaced with the content of your custom page using ajax. This is a perfectly valid way of doing it, especially if you have only one or two pieces of secondary content. What if I want to conditionally load the WordPress sidebar on every page, and the contents of the sidebar is not necessarily the same everywhere? Creating page templates and pages for all that secondary content can become messy and error-prone. My esteemed colleague (and boss) Aki suggested a better way of doing this would be to check for a specific parameter in PHP and generate either the main content or the sidebar. All we need is the sidebar version of the page to have its own URL. Enter Sandman WordPress Endpoints! URL endpoints are part of the Rewrite API, and are used for many things, among others to generate feeds (via /feed/) and paging (eg. /page/2/ to see older posts or the second part of split post). The following code will register a new endpoint /part/. The above code should go in the theme functions.php file, or better yet, a separate plugin. 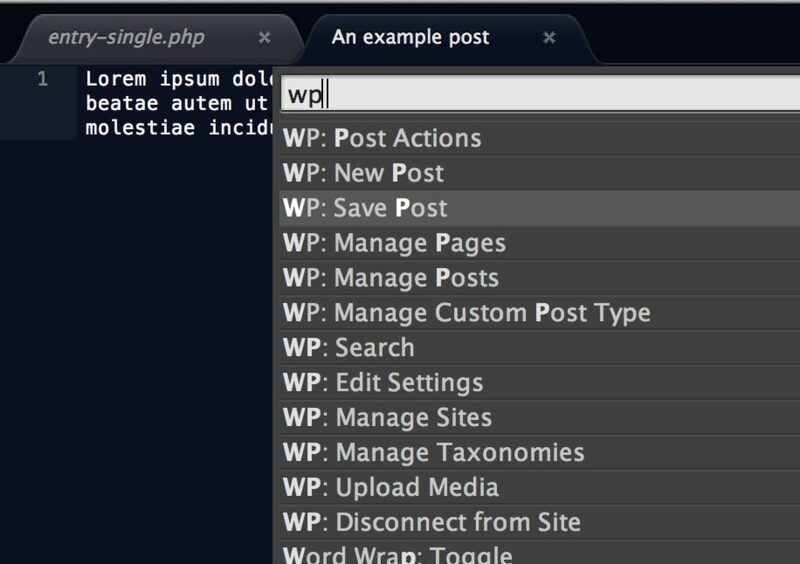 To make the endpoint actually work you might have to clear your rewrite rules — simply opening the WordPress Permalinks settings and saving should do the trick. That’s all! A functioning demo can be seen on this blog: try loading it on a small screen vs. a wide screen. More information on endpoints in the Codex.